The WSJ says Google is in talks to but YouTube for $1.6bn. I gather that TechCrunch got the scoop so good for Mike. Blogs rock. I see the WSJ print as affirmation though. When old media and new media agree about something, there must be something there. It makes a ton of sense for all parties and is sort of an insider deal with Sequoia (the best vc firm in the business right now) on both sides of the deal. Brings to mind John Doerr’s comment, "no conflict, no interest." Google video plus YouTube will make Google a force in online video, which according to Comscore’s recent ratings is something they have not been able to do on their own. The question I am wondering is whether Yahoo and others can let this happen without making a move on YouTube as well. 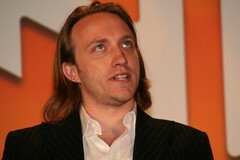 Chad Hurley and his team have done a great job buiding the best thing to happen to the net in several years. If this happens, they deserve every penny. Newer post Jim Cramer on GOOG/YouTube Older post Freedom of Uploading?